I know it’s hard to capture Lightning on camera, but i’m hoping that one of you has some photos of this little DAF. 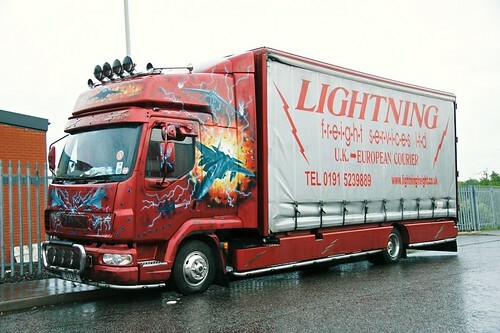 It used to belong to Lightning Freight, who are no more, but i have had some emails from its old driver but he was never a camera man, so there are no pics to go with his info. One of must be able to help?? Email me, ben@truckblog.co.uk if you can help. It would be good to get some photos of it when it was out and about on the road. This entry was posted in DAF, Drivers Photos, International Mega Trucking by truckbloguk. Bookmark the permalink.